Above - the two most commonly seen marks in use 1921 - 1934. The abbreviation 'Ltd' was added after 1925 but the original mark remained in use until 1934. It follows that the absence of 'Ltd' does not signify that a piece was made before 1925 but the inclusion of 'Ltd' means that a piece was made from 1925 onwards. Poole Pottery is probably best known for the 'Traditional ' range of hand painted designs created by Truda Carter after her arrival at the Pottery in 1921. Alongside the Traditional range the pottery produced decorative ware in a wide and popular variety of styles. Above - 'the Bull' designed by Harold and Phoebe Stabler in 1914 and made at Poole in the 1920's and early 1930's. The retail price in the 1923 catalogue was 6 guineas. Above - pierced faience wall panel probably designed by John Adams c.1932. There were two similar panels in the East Quay works tea-room, one of which can be seen in situ at page 137 of Jennifer Hawkins' book. Buff stoneware models designed by Phoebe Stabler and made at poole from 1922. From left to right Lavendar Woman, Piping Boy and Bath Towel. Above - Picardy Peasant, Buster Boy and Buster Girl designed by Phoebe Stabler. (Left) eagle and (right) love bird book-end in slip-cast white earthenware with vellum white glaze, designed by Harold Stabler. Above - Harold Stabler love birds adapted as a (rare) Carters tile. Above - monkey book-ends designed by Hugh Llwellyn 1922-1923. The models appear to show a mother with her young and are often mistakenly described as the 'three wise monkeys' after the description in Hayward and Atterbury. (The three wise monkeys usually include one monkey with eyes covered, one with ears covered and one with mouth covered to illustrate the Japanese proverb which translates as 'see no evil, hear no evil, speak no evil). 1930's springbock book ends, rabbit, squirrel, fish, rocking horses and Airedale designed by John Adams. Above - bear cubs designed and modelled by Marjorie Drawbell, 1948-1952. Marjorie was a member of the Royal Society of British Sculptors who studied at Regent Street Polytechnic under Harold Brownsword. Above - wall-mounted dogs’ heads with Picotee glazes, designed and modelled by Harry Brown, 1938-9. Slip cast book ends number 815 in a sapphire blue glaze. Two vases with unusual decoration of naturalistic fruit. Above - angular Harold Stabler design, 1925-26. 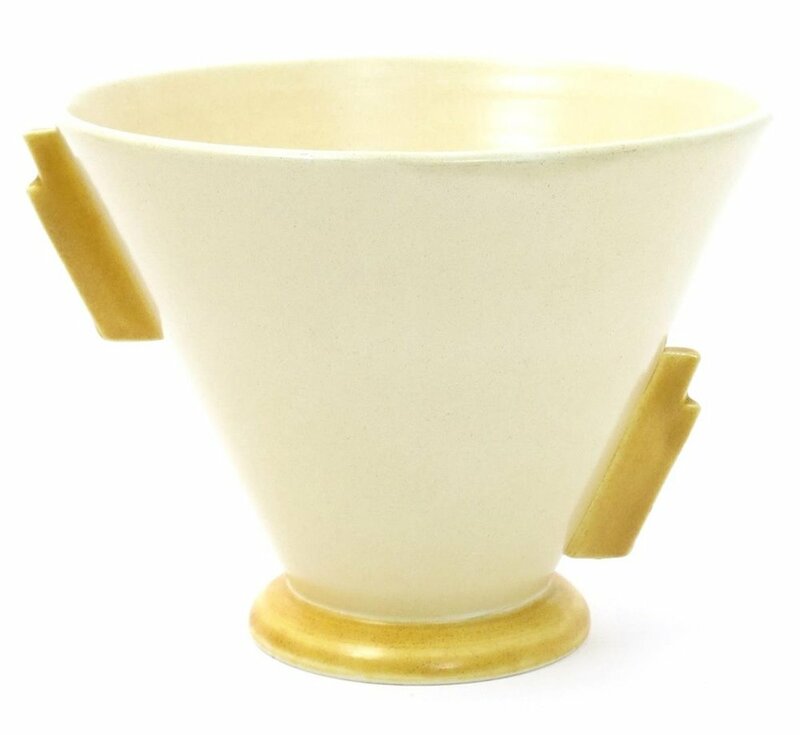 Designs and glazes by John Adams, early 1920's. 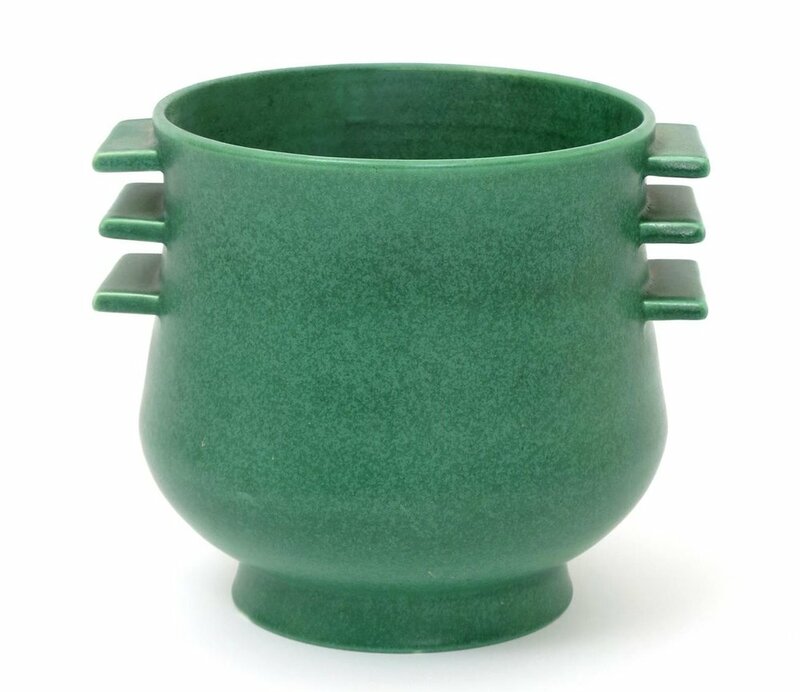 Above - semi-matt green 'Monastic' glazed vase (c 1921) designed by James Radley Young, incised CSA mark. John Adams developed specialised glazes, notably Uranium Orange (derived from depleted uranium and mildly radioactive) and Chinese Blue (below). Red earthenware vases in the 'Chinese Blue' reactive glaze developed by John Adams in the early 1920's. Vases in this pattern appeared alongside traditional designs at major exhibitions. Above - the price label on the base of the left hand vase shown above. Russell and Sons sold hand made furniture in the Arts and Crafts style in the 1920's. Both Carter and Co and Russell and Sons exhibited their wares at the British Empire Exhibition in 1925. (Sir) Gordon Russell went on to have a long association with the Pottery and helped launch the Delphis Collection at Heal's in 1963. Above CSA bowl with a tangerine reactive glaze developed by John Adams. Above - 1930's vases. The four larger vases are probably designed by John Adams; the handles are modelled as stylised doves. 'Sylvan' was the name given to a range of vases, bowls, dishes and other shapes decorated with a broken or mottled glaze giving a marbled effect. The same range of shapes was also available in plain colours - pastel grey, pastel pink, pastel green and pastel blue, sapphire blue, apple green and zulu black. Vases with the 'Sylvan effect' were commissioned by Cunard for the Queen Mary. Plane Ware was a range of vases in contemporary art deco shapes with applied handles and 'wings'. The shapes were designed by John Adams and Truda Carter. 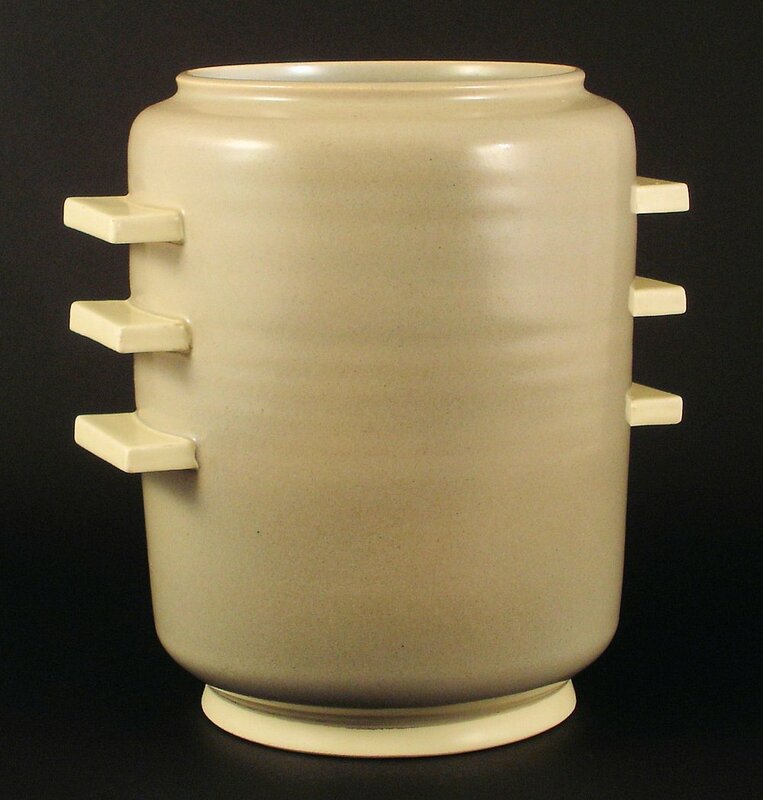 Pieces usually have the impressed 'Poole England' mark and the name of the design or the glaze used. 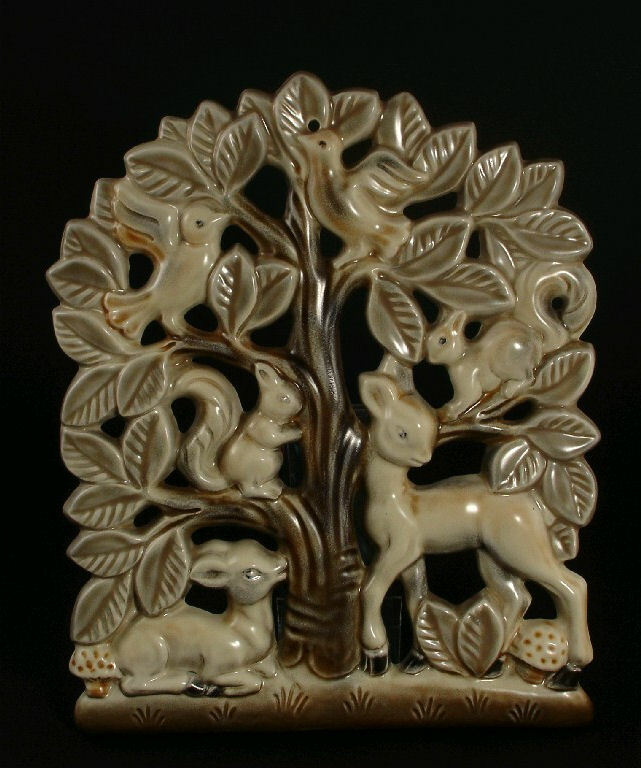 The Everest Ware range of table and decorative ware was introduced in 1932. 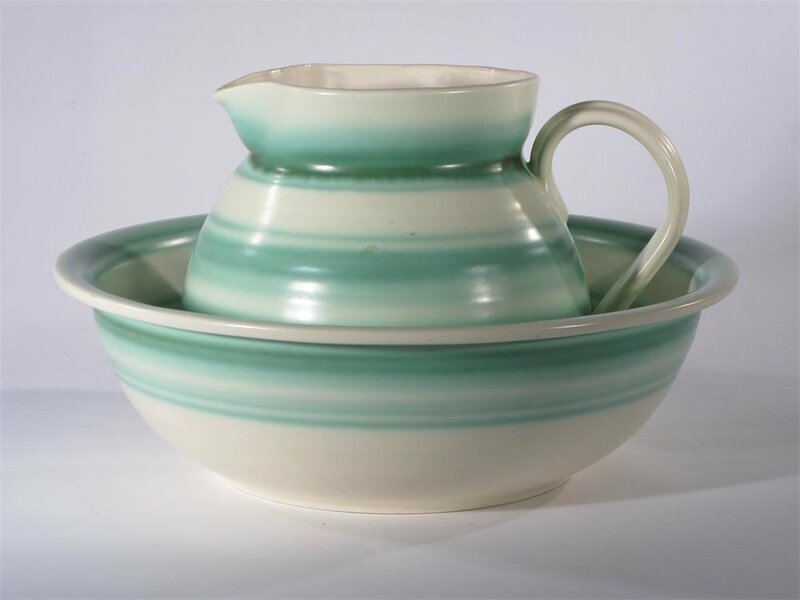 The characteristic bands, ridges and pastel colours of the Everest Ware range were 'similar in inspiration to Keth Murray's designs for Wedgewood' (Hayward and Atterbury). The Picotee range introduced in 1932 is characterised by bands of sprayed glazes in single or contrasting colours, set against a magnolia base. The initial design was by John Adams and was named after a carnation. The technique of spraying glazes had been developed by Leslie Elsden. Pierced wall decoration in Picotee glazes. Designed by Lily Markus, c 1951.